New Haven Living: Players: Now, That’s A Sandwich! 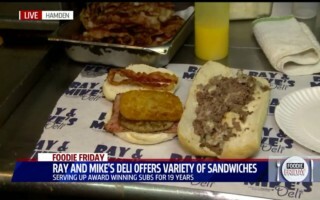 If there is a key to the perfect sandwich, Ray George has it, as he unlocks pure goodness at his Hamden staple, Ray and Mike's Deli. From the award-winning steak and cheese grinders to "The Irresistible," which adds buffalo chicken to his signature steak and cheese. These imaginative hoagies are packed with flavor and have been filling bellies since 1997. RT @tj_fitzpatrick: @RayandMikesDeli The most important thing tomorrow will be to make 420 BLTs right???? The Quickwich is unique and delicious. It is a steak and cheese sub with macaroni and cheese. ...Everything is fresh and made when you order it. The folks who work there are friendly and Ray & Mike are both cool guys. Best sandwiches in the area by far and other than a couple of employees it's run by some cool guys. Ray is a very nice guy. 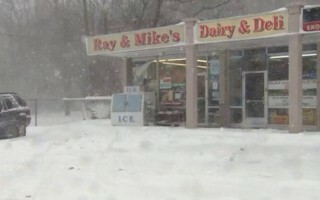 Ray & Mike's Dairy & Deli © 2018. All rights reserved.